The National Environmental Standards for Air Quality include a design standard for wood burners in urban areas. The standards apply to wood burners, but not to cooking stoves that burn wood. Therefore our stoves are exempt from the National Standards throughout the majority of New Zealand and can be installed anywhere on any size property. Auckland: if you look at Table 1 here, any property classed as ‘Rural’ is allowed to install a Homewood, as they fall under ‘Other domestic fires’. For other zones, resource consent approval may be required. Nelson: Rural properties greater than 2 hectares are allowed a Homewood wood stove, for other properties see here. If you are in Airzone 3 you are allowed a Homewood cooking stove. Hawke’s Bay: There are different air zones in the Hawke’s Bay (within the Napier and Hastings Airsheds) therefore the information that you need to look at will depend on where you are planning to install the wood stove. Check out the air plan to find out which air zone you are in and then what your air zone rules are here. 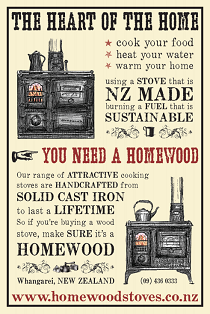 If you are located outside of the Hastings or Napier Airsheds then you are allowed a Homewood wood stove. Check out your council here to confirm they have not applied stricter standards. This information was current as of December 2015.